Test Driven Development has become a crucial activity for every modern development methodology. This chapter will cover the built-in support for testing provided by Wicket with its rich set of helper and mock classes that allows us to test our components and our applications in isolation (i.e without the need for a servlet container) using JUnit, the de facto standard for Java unit testing. In this chapter we will see how to write unit tests for our applications and components and we will learn how to use helper classes to simulate user navigation and write acceptance tests without the need of any testing framework other than JUnit. The JUnit version used in this chapter is 4.x. The central class in a Wicket testing is org.apache.wicket.util.tester.WicketTester. This utility class provides a set of methods to render a component, click links, check if page contains a given component or a feedback message, and so on. The basic test case shipped with TestHomePage illustrates how WicketTester is typically instantiated (inside method setUp()). In order to test our components, WicketTester needs to use an instance of WebApplication. Usually, we will use our application class as WebApplication, but we can also decide to build WicketTester invoking its no-argument constructor and letting it automatically build a mock web application (an instance of class org.apache.wicket.mock. MockApplication). The code from TestHomePage introduces two basic methods to test our pages. The first is method startPage that renders a new instance of the given page class and sets it as current rendered page for WicketTester. The second method is assertRenderedPage which checks if the current rendered page is an instance of the given class. In this way if TestHomePage succeeds we are sure that page HomePage has been rendered without any problem. The last rendered page can be retrieved with method getLastRenderedPage. That's only a taste of what WicketTester can do. In the next paragraphs we will see how it can be used to test every element that composes a Wicket page (links, models, behaviors, etc...). A click on a Wicket link can be simulated with method clickLink which takes in input the link component or the page-relative path to it. In the code above we have used clickLink to click on the "reload" button and force page to be rendered again. In addition, we have used also method assertLabel that checks if a given label contains the expected text. By default clickLink assumes that AJAX is enabled on client side. To switch AJAX off we can use another version of this method that takes in input the path to the link component and a boolean flag that indicates if AJAX must be enabled (true) or not (false). assertEnabled(String path)/assertDisabled(String path): they test if a component is enabled or not. assertVisible(String path)/assertInvisible(String path): they test component visibility. assertRequired(String path): checks if a form component is required. If test requires a page we can use startComponentInPage(Component) which automatically generates a page for our component. WicketTester allows us to access to the last response generated during testing with method getLastResponse. The returned value is an instance of class MockHttpServletResponse that provides helper methods to extract informations from mocked request. To simulate a request to the custom resource we used method startResource which can be used also with resource references. In paragraph 13.9 we have seen how to configure our application to store resource files into a custom folder placed inside webapp root folder (see project CustomFolder4MarkupExample). In order to write testing code for applications that use this kind of customization, we must tell WicketTester which folder to use as webapp root. This is necessary as under test environment we don't have any web server, hence it's impossible for WicketTester to retrieve this parameter from servlet context. //clear any side effect occurred during test. If we want to submit a form with an external link component we can use method submitLink (String path, boolean pageRelative) specifying the path to the link. In the next paragraphs we will see how to use WicketTester and FormTester to interact with a form and with its children components. setValue(String path, String value): inserts the given textual value into the specified component. It can be used with components TextField and TextArea. A version of this method that accepts a component instance instead of its path is also available. setValue(String checkboxId, boolean value): sets the value of a given CheckBox component. setFile(String formComponentId, File file, String contentType): sets a File object on a FileUploadField component. select(String formComponentId, int index): selects an option among a list of possible options owned by a component. It supports components that are subclasses of AbstractChoice along with RadioGroup and CheckGroup. selectMultiple(String formComponentId, int indexes): selects all the options corresponding to the given array of indexes. It can be used with multiple-choice components like CheckGroup or ListMultipleChoice. assertInfoMessages(String… expectedInfoMessages): asserts that the expected info messages are rendered in the page. assertErrorMessages(String… expectedErrorMessages): asserts that the expected error messages are rendered in the page. Component model can be tested as well. With method assertModelValue we can test if a specific component has the expected data object inside its model. If we need to test component markup at a more fine-grained level, we can use class TagTester from package org.apache.wicket.util.tester. The name of the tag found by TagTester can be retrieved with its method getName. Method createTagsByAttribute returns all the tags that have the given value on the given attribute. In the code above we have used this method to test that our markup contains two tags having attribute class equal to myClass. 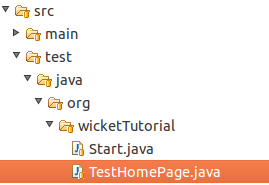 With a component-oriented framework we can test our pages and components as we use to do with any other Java entity. Wicket offers a complete support for writing testing code, offering built-in tools to test nearly all the elements that build up our applications (pages, containers, links, behaviors, etc...). The main entity discussed in this chapter has been class WicketTester which can be used to write unit tests and acceptance tests for our application, but we have also seen how to test forms with FormTester and how to inspect markup with TagTester. In addition to learning how to use the utility classes provided by Wicket for testing, we have also experienced the innovative approach of Wicket to web testing that allows to test components in isolation without the need of running our tests with a web server and depending only on JUnit as testing framework.